A malevolent Russia plotting against the Free World is a trope for the Western press, but mysteriously, plots attributed to Kremlin machinations are somehow never realized. RT looks at how the mainstream media’s Russia scaremongering proves baseless. Examples of the trend past and present are not hard to find. Arguably the biggest at the moment is how a military exercise called Zapad 2017 is being covered, especially in the Baltic States and Poland. 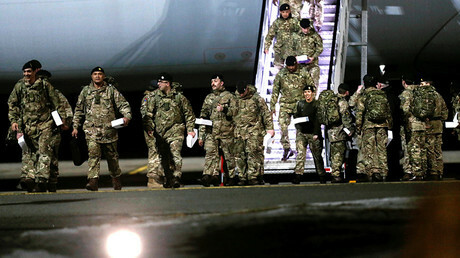 The exercise is to be conducted by Russia and its ally Belarus in September, but for months now officials and commenters have been warning that they will serve as cover for an invasion. No matter what the two nations do to make the drill transparent and allay concerns, nothing seems to ease the fearmongering, and even the ameliorating moves themselves are reinterpreted as ‘maskirovka’, the Russian brand of military deception. “I am certain that they will invite observers to some demonstrative actions and allow them to see what they want them to see. But they would not be allowed to see any detail,” Lithuanian Foreign Minister Linas Linkevičius said Wednesday in an interview with the national radio. Zapad drills are held by Russia and Belarus every two years, with their timing announced months ahead. This year they will involve some 13,000 troops, the majority of them Belarusian. 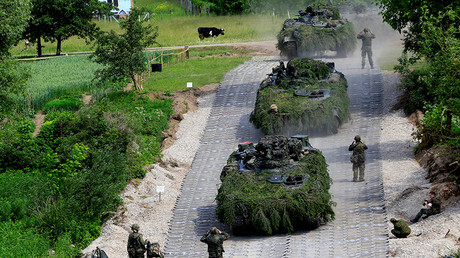 In the run-up to the exercise, Lithuanian President Dalia Grybauskaite branded them “aggressive games directed against the West.” And Lieutenant-General Ben Hodges, commander of US Army forces in Europe, said they may be a “Trojan horse” to move troops and weapons. Other theories about what Russia may be planning under the guise of the war games include: deploying ballistic missiles in Belarus, sending saboteurs across the Belarusian border with Ukraine, occupying Belarus, and of course overrunning Baltic NATO allies to test its resolve to fighting a war with Russia. NATO has pledged to double its air patrols over the Baltics during the Zapad exercise and held dozens of war maneuvers of its own in Europe to instill confidence among its concerned members. For comparison, NATO’s Saber Guardian 17 drills which were held in Bulgaria, in July involved 25,000 military personnel from more than 20 countries – just across the Black Sea from Russia. Representing each major military exercise or surprise check of troops’ readiness by Russia as a provocation and a potential threat of war has a long tradition. Even when the drill is conducted on Russia’s own territory – that is, almost always. There were claims that the Kavkaz 2009, held a year after Georgia’s failed invasion of South Ossetia, would lead to a Russian war with Georgia. The same drill held in 2016 was said to have Ukraine in its imaginary crosshairs. And anyway, Russia’s desire to keep its military in good shape is ‘preparing for mega war’, some would have you believe. Training for war is not the only way the Russians can be scary for the Western audience. There is also Russia’s presence at “our borders” – for instance, the regular patrols of Russian warplanes along Britain’s shores. 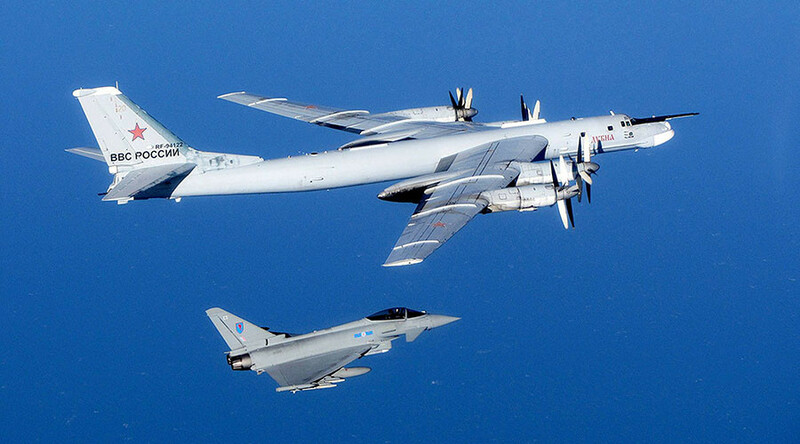 The tabloids in UK seem so consider it their duty to report every time the RAF scrambles fighter jets to shadow Russian aircraft passing by. Of course, it’s only at the end of the story that the reader learns that no actual violation of British airspace happened. The habit of hyping air encounters sometimes ends with the joke being on the British media. In 2014, a “Russian military plane” was reported as invading the country’s airspace and traveling incommunicado over Kent as the RAF threatened to shoot it down. The plane turned out to be a Latvian civilian transport of a decades-old model also used by the militaries of many nations, which had a malfunction. 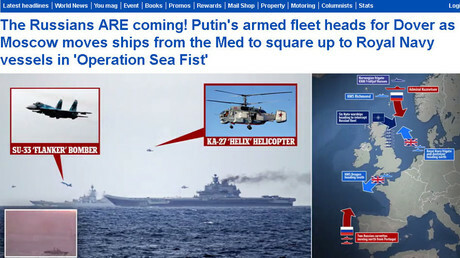 Other Russian military craft receive similarly intense coverage from the British media. Last year journalists in UK were awash with speculation over potentialthreats posed by ‘Admiral Kuznetsov’, Russia’s only operational aircraft carrier, as the ship along with its naval group were preparing to pass the English Channel. By the time she was returning from her deployment to Syria, the press was scrutinizing the cost of the Royal Navy’s response to the Russian warships. And in June 2016, the media reported the discovery by the vigilant British Navy of a Russian attack submarine in the English Channel. The reports provoked ridicule from the Russian Defense Ministry, which said the sub in question was not even submerged while sailing under the watchful eye of the Britons. The Swedish military apparently got some training and a purported budget boost, while their neighbors in Norway seized the chance to have a few laughs at the expense of the media hype. A non-existing Russian submarine was blamed for damaging a Northern Irish trawler in 2015. The collision did involve a sub, but it flew the Union Jack, not the St. Andrew’s blue-on-white cross of the Russian Navy. Across the Atlantic, the fear of the Russians is more focused on information warfare and cyberattacks. On New Year’s Eve, Russian hackers were accused by the Washington Post of penetrating the Vermont power grid, after a utility reported finding a specific type of malware on a computer in its office. The fact that the computer was not even connected to the grid didn’t stop the newspaper from adding a bit of Russian threat to its story, and only later it was forced to backtrack on it. It came less than a month after the newspaper drew fire for lending credibility to an organization claiming to be tracking “Russian propaganda” online by publishing an endorsing report on the effort. PropOrNot blacklisted a number of alternative media as propaganda – and “particularly Russian propaganda” – and never bothered to back its accusations by actual evidence. 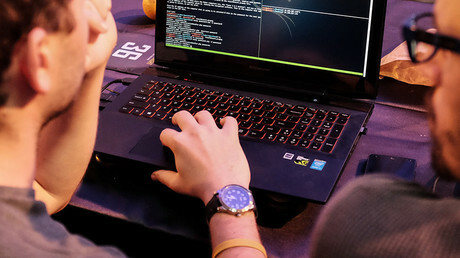 A more recent CNN story about Russia’s supposed cyberwarfare operations claimed that “Russian hackers” were responsible for triggering the ongoing diplomatic fallout among the Gulf nations. The “Russian” in this case may be actually “Emirati”, it was later reported. Amid the hysteria, Russia resorts to sporadic trolling.